For online application for admission, candidates need to go through the official website of MSU and fill the application form there. Applicants need to select their choice of course and specialization. They should follow the instructions and fill the application form carefully. After filling the application form with proper details, they need to pay the application fee as prescribed for the respective course. The application fee can be paid through Net Banking/ Debit Card/ Credit Card. 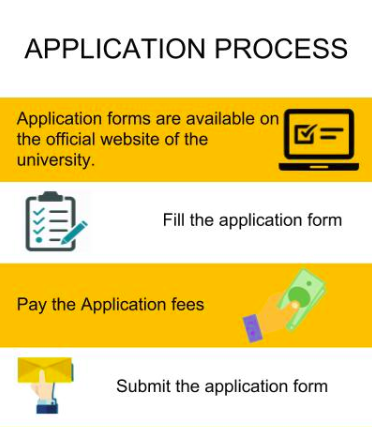 After successful payment of application fee, they should submit the form Online. Candidates are selected on the basis of an entrance examination that is held by the university. The candidate must have passed 10+2 or High School Senior Secondary Exam prescribed by the Central Board of Secondary Education (CBSE) or any equivalent exam conducted by any State Board to take Maharaja Sayajirao University of Baroda, Gujarat admissions 2019. The candidate must have English as one of the main subjects on the 12th Board. Candidates should have passed 10+2 with Physics, Chemistry and Mathematics. A candidate having passed 10+2 in any stream with English as one of the main subjects with a minimum of 45% marks. The candidate must have passed 10+2 or High School Senior Secondary Exam prescribed by the Central Board of Secondary Education (CBSE) or any equivalent exam conducted by any State Board to have Maharaja Sayajirao University of Baroda, Gujarat. The candidate must have a minimum aggregate of 50% marks (for outside) and for local 40% marks. The candidate who has completed his/her 10+2 in any stream with English as one of the main subjects with a minimum of 50% marks from any recognized University. To pursue B.Des a candidate should pass his/her H.Sc. level or equivalent examination in any system as a full time student and must have English as one of the subjects in 12th Std. A student seeking admission into Bachelor of Library Science and Information Science programme must possess a Bachelor's degree in any discipline with at least 50% marks or an equivalent grade of this University or any other statutory university recognized as equivalent thereto. There is a reservation of 5% who belongs to reserved category. Eligible students will be called for the Personal Interview. Candidate should have passed 12th (H.S.C.) Science/ General stream or equivalent examination from recognised board to pursue B.Sc from Maharaja Sayajirao University of Baroda, Gujarat. Aspirants should have passed HSC with minimum 40% from GHSEB, CBSE, ISC, NIOS or Equivalent board And Minimum marks for General Category for candidate living outside of Vadodara Dist: 50 %, Outside Gujarat: 60%. Aspirants should be passed with SSC and HSC or Equivalent Board Exam with a minimum of 45% (5% Relaxation to SC/ST Student). Candidate should have English as one of the Subject. Applicants seeking admission for BVA Degree Programme require HSC level or its equivalent examination as a full time students with 50% marks. Applicant who failed in any subject will not be eligible. And Relaxation of 5% will be given to candidates with Art as one of the subjects in 10th/12th Std OR who has passed intermediate drawing examination. Relaxation will be given to SC/ST students according to the Government of rules. English subject compulsory for 12th Std. Candidates who have passed 10th with English and who successfully completed Certificate or its equivalent in the language concerned. Candidates who have completed his/her certificate course in German or equivalent examination from any recognized University/ Institute are eligible for the admission to the Diploma course in German. Candidate having a Bachelor's Degree in B.Com / BBA / BBS / BA(with Economics) as one of the subjects with a minimum of 40% marks from any recognized University. Candidates having a Bachelor's degree in any discipline with a minimum of 45% marks are eligible to apply for Maharaja Sayajirao University of Baroda, Gujarat. Aspirants should score 45% of total marks in 10+2+Graduation in any discipline or Equivalent for General Category, 42% for OBC/SEBC Category, 40% for SC/ST Category And should pursue English as one of the subjects in Graduation to get Maharaja Sayajirao University of Baroda, Gujarat. Candidates must have a Bachelor's Degree in relevant discipline. 5% relaxation will be given to the candidates belonging to the reserved categories as per the prevailing rules of the Government of Gujarat. Candidate having a Bachelor's degree in B.Com / BBA / BBS or equivalent degree with a minimum of 55% marks from any recognized University. Diploma from a reputed institute like NID, NIFT, IIT or IICD And As a REGULAR student with a minimum of 50% of marks. The student seeking admissions to this course must possess a Bachelor's degree in any discipline with at least 50% marks (45% for reserved category) or equivalent grade from any recognized University. B.Sc. Examination with Chemistry/Industrial Chemistry/ Applied Chemistry as principal subject and any subsidiary subject with minimum 45% of marks at the final year or equivalent CGPA. Passed B.Sc. Examination with at least 45% marks in Physics/Electronics and Mathematics as one of the subsidiary subjects, or with Physics and Mathematics as subsidiary subjects. Passed B.Sc Examination with Mathematics as a principal subject from M.S.University and secured 45% or equivalent CGPA are eligible. Bachelors in Mathematics or Physical Science / Graduate in any Engineering discipline. Students seeking admission would require a minimum of 55% marks. B.F.C.Sc. or B.Sc. (Home) in any area of specialization of Home Science or B.Sc. (Home) Degree in Extension & Communication. Bachelor's degree in Science or Arts with Home Science as one of the core subjects. B.F.C.Sc. or B.Sc. (Home) with specialization in Family Resource Management / Home Management./ Family and Community Resource Management. Minimum of 55% and above at the last qualifying exam at UG level is required for eligibility. Candidate should be a graduate from any discipline from recognized University. Seats for SC, ST, NT and SEBC candidates shall be reserved as per the GOG rules. MVA Graphic Arts (Print Making) Programme require B.V.A. Degree in Fine Arts/Visual Arts with specialization in any subject. Candidates with Diploma are not eligible for MVA Programme. Candidates having BVA degree in (12+4) pattern are only eligible for MVA in Graphic Arts (Print Making) Programme. The person should be getting a minimum of 45 percentage in their 12 std board result. Maharaja Sayajirao University of Baroda conducts their own exam and it has 4step process 1. writing test 2. group discussion 3. creative writing 4. personal interview. The eligibility criteria in the Maharaja Sayajirao University of Baroda totally depends on the core subject you want to pursue.The admission procedure is very simple.Firstly fill an online admission form online.Then you have to be in touch with the university office, to know about the further admission details.You have to come to Vadodara for filling up your course form with your documents like 12th Marksheet, School Leaving, Migration(If from another city) and Address proof. For admissions in BBA at the Maharaja Sayajirao University of Baroda, there is a four stage screening process which includes a written test, creative writing, group discussion and personal interview. The eligibility criteria for getting admission in the Maharaja Sayajirao University of Baroda is to pass the 12th with 45% of marks and having English has one Major subject. We need to give entrance exam for taking the admission. There are total of 120 seats. I was lucky that in the entrance exam I got the 65 th position among 450 students. Basic thing is the entrance exam. Then There should not be any gap after 12 th. You should not have a year or more gap for this. Then they go with our 10th,12th result. It's not so difficult to get admission. Talking about studies, it's the best place for learning coding is Maharaja Sayajirao University of Baroda. You have to go through an entrance test if selected then GD/PI. The Faculty of social work- Maharaja Saya JI Rao university has their own entrance exam in which they ask about psychology, sociology, philosophy, basic maths, current affairs, logical reasoning. They select only 40 students from the whole. The eligibility criteria for the admission in Maharaja Sayajirao University, I cleared Entrance exam, group discussion and personal interview. I cleaed entrance examination which conduct by social work faculty of the MS University. Only top 40 student selected by their performance in entrance examination, group discussion and personal interview. The Maharaja Sayajirao University of Baroda (MSU), formerly Baroda College is a public university in the city of Vadodara, in Gujarat state, India. Eligibility criteria- depends on the course you are going to opt. For psychology there was no entrance exam conducted , it was based on merit list. Cut off of taking psychology is 75% . The eligibility for getting admission in Maharaja Sayajirao University of Baroda is to pass the 12th board exams. No entrance exams were conducted. The cut-off varies from year to year and when I got admission it was 60% to 65%. The admission procedure in Maharaja Sayajirao University of Baroda, Gujarat is very simple. We have to select our subjects and submit our admission forms and required documents. No entrance exams are conducted. The eligibility criteria are 71% or above. Eligibility criteria for the admission for my course was 12th pass. There were no entrance examination and were no cutoffs. The admission was based on the percentage of 12th Board and students with higher percentage were granted the admission first. Eligibility criteria is 12th pass in any stream for getting into the Maharaja Sayajirao University of Baroda. Maharaja Sayajirao University gives opportunity to students who completed 12th class and those who complete UGC. It doesnt require any entrance exam and the required marks is above 50%. 40+ percentage for general category & 35+ percentage for OBC category students must have for admission in the Maharaja Sayajirao University of Baroda. The eligibility to get admission in our college is to pass 12th standard and no separate entrance exam is conducted. But, it was on interview basis. The cutoff mark for general category is 75%. The eligibility criteria are Bachelors in any of the life science fields with minimum 55% of marks. Admissions are purely based on entrance test merits. The eligibility criteria in Maharaja Sayajirao University of Baroda is based on your 10th and 12th-grade results. Eligibility criteria were HSC passed and the admission process was as per Merit basis according to 12th percentage scored by the candidate. Cut off marks for the institute was 48%. The only way to get admission in MSUB is by Passing both the exams and getting a good rank in both Gujarat board exams and the JEE Mains exams. Admission procedure is based on merit list which was decided by the scores of JEE Mains and PCM marks in boards. Entrance exam I tool was JEE Main. The faculty of law under Maharaja Sayajirao University takes its own exam and even considers merit marks. One has to apply online in the month of May. The eligibility criteria are dependent on the merit list. The students who have cleared JEE MAIN entrance exam. I did not take any entrance examination recently. The typical cutoff for my course is 50%. To get admission here students has to write test, studio test and have to clear the interview. you have to pass 12th standard with good marks or apply through management quota to get admission in this college. You need to pass 12th standard with good marks or apply through management quota to get admission in my college. The students must pass 12th standard with good grades to get the admission in this college. Students can get admission through 12th pass result or management quota. No exams needed. The eligibility criteria for admission is 12th pass with a minimum of 65% marks. The admission procedure is too easy for any course or stream. 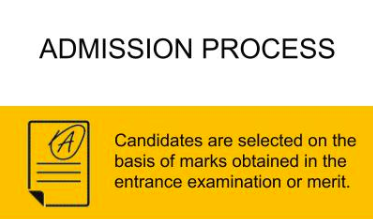 The admission process is based on the JEE rank score. 1. Candidates should have passed Hthe qualifying examination with A, B or AB group from the Gujarat higher secondary Examination board or the central board of secondary education or the council of Indian school examination or equivalent board. 2. A candidate who has passed the qualifying examination after appearing in hte supplementary examination conducted by Gujarat board shall also be eligible for addmission in the current academic year on availiability of seats. What is the admission process for Bcom in Maharaja Sayajirao University of Baroda, Gujarat? A) A Candidate must have passed / Appeared in the Higher Secondary Certificate (H.S.C) Examination (XIIth Standard) in ANY STREAM of Gujarat Secondary Education Board, Gandhinagar or its Equivalent Examinations of Any Other Examining Body recognized equivalent thereto with ENGLISH as a Compulsory Subject. (B) Maximum 5 % of approved intake capacity of F. Y. B. Com. [with effect from Academic Year 2013-2014] shall be given admission to those students who have passed / Appeared in the Higher Secondary Certificate (H.S.C) Examination (XIIth Standard) of Gujarat Secondary Education Board, Gandhinagar or its Equivalent Examinations of Any Other Examining Body recognized equivalent thereto with ENGLISH as a Compulsory Subject other than 12th Commerce. (C) Admissions for F.Y B.Com at Faculty of Commerce will be subject to Minimum of 45% aggregate marks secured at H.S.C [12th Standard Examination] or its equivalent for Baroda (Local) Including Baroda District Students, and Minimum of 55% aggregate marks secured at H.S.C. [12th Standard Examination] or its equivalent for all other students considering availability of number of seats (as per S.R. No. 15, 26/06/2015). (D) Admissions for F.Y B.Com at M.K Amin Arts & Science College And College of Commerce, Padra will be subject to Pass at H.S.C [12th Standard Examination] or its equivalent for Baroda (Local) Including Baroda District Students, and Minimum of 40% aggregate marks secured at H.S.C [12th Standard Examination] or its equivalent for all other students considering availability of number of seats (as per S.R. No. 15, 26/06/2015). What is fees structure for BE in msu? What's the fee structure for BE (Civil Engineering) in Maharaja Sayajirao University of Baroda, Gujarat? The fee structure for BE (Civil Engineering) in Maharaja Sayajirao University of Baroda, Gujarat is given bellow.